individual fulfillment and company success. Should a company help its employees take care of personal errands? Because miscellaneous errands from home prevent many employees from being happy and focused at work, can lead to exhaustion and demotivation, and even (as is too often the case for women) prevent them from leading the career they desire. Should a company take care of employees’ wellness? Because employees’ health directly impacts their performance and motivation, and when unattended to can be costly not only for the individual but also the company. Activities like yoga and meditation not only cater to a healthy mind and body, but will bring happiness and stimulating interaction to employees. Should a company strive to create networks among employees and with outside entities? Because being exposed to new knowledge, having open conversations with managers and different team members, and tuning in to what is happening in the world will lead to a more dynamic workplace. In a rapidly changing society, creative ideas deriving from communication are an essential asset to the company. TPO is a partner for companies that recognize preparing for the future includes creating a workplace where all employees are happy and motivated in their work life. 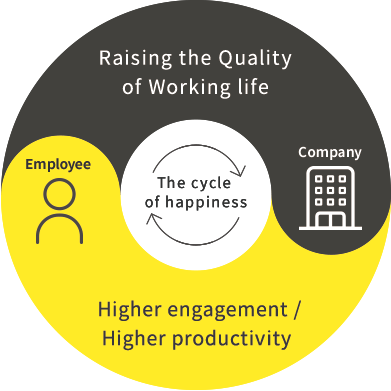 We believe that a workplace where work and life are both well supported will attract diverse and creative talent, and unlock the potential of all employees to bring innovative ideas and outcomes to the company. experiences with the members of FAJ - the network for french-speaking working women on empowering women in Japan. We are pleased to announce that we have relocated our office. We have relaunced our website. Along with the launch, we have redefined our mission, vision and values. Our English site will launch late December.